In traditional Scottish highland dress a knife called a sgian dubh, (prounounced skeen doo), is worn in a sock. Pictured above, a sgian dubh handle has been cleverly repurposed into a beautiful brooch. In Gaelic sgian means knife or dagger, and dubh means black. In this context, black is thought to mean hidden, or secret. This conclusion stems from the antecedent of the sgian dubh – the sgian achlais, (pronounced ochles), a larger dagger concealed in a jacket sleeve dating to the 17th and 18th centuries. Upon visiting someone’s home, visitors were expected to reveal their weapons. Sgian dubh brooches resulted from the Scottish Romantic period in the nineteenth century, a revival movement inspired by the historical novels of Sir Walter Scott and King George IV’s visit to Scotland in 1822. The King’s image in traditional highland garb and a historically-themed pageant helped cement Scottish national identity, uniting all Scots through a distinctive, national dress. 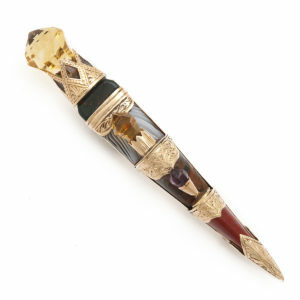 Queen Victoria, too, ever the tastemaker of her day, greatly contributed to Scottish romanticism, with ornamental sgian dubhs and other Scottish daggers peaking during her period of rule.